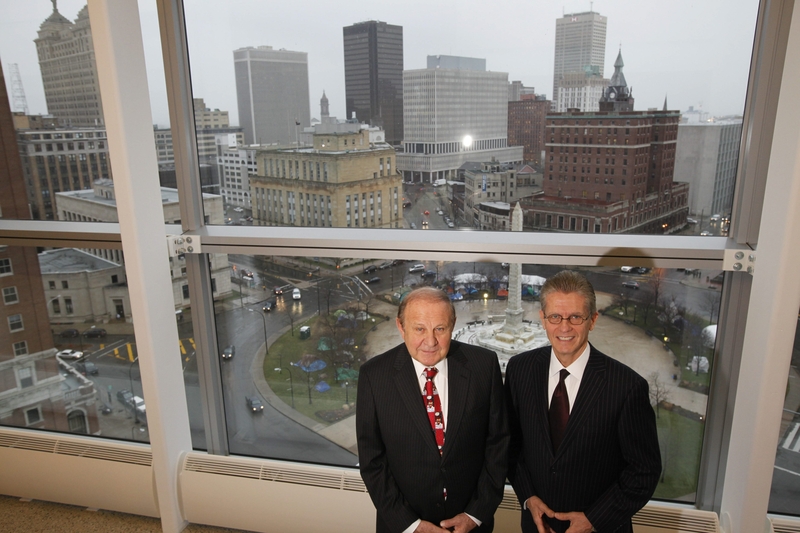 On a day when most people reveled in the University at Buffalo’s first ever appearance in the NCAA Basketball Tournament, William M. Skretny’s friends and family did their own celebrating at the Robert H. Jackson Courthouse. The occasion was the unveiling of the U.S. District judge’s official portrait, and the jokes, speeches and roast-like jabs gave it the air of a party. Left unsaid was the reality of what Skretny’s move to senior status, as well as a similar move by U.S. District Judge Richard J. Arcara, means to a court system everyone views as overburdened. Buffalo, for the first time in a long time, at least 55 years, is without a single active federal district judge. Skretny and Arcara are sticking around and overseeing a large number of cases, but lawyers worry that one of the nation’s worst backlogs – it still takes more than five years for the median civil case to go to trial in Buffalo – will worsen over time. Privately, they also wonder when help might arrive and if the two candidates, both well-known figures in the legal community, picked to replace Arcara and Skretny will ever be confirmed by the U.S. Senate. Lawrence J. Vilardo, a Canisius College and Harvard Law School graduate, has been recommended by President Obama to replace Arcara and is viewed as a shoo-in for confirmation, according to lawyers familiar with the process. In their eyes, the only question about Vilardo’s confirmation, which is before the Senate Judiciary Committee, is when, not if. There is concern, however, over the fate of Denise O’Donnell, the former federal prosecutor recommended to replace Skretny. Even though Sen. Charles E. Schumer submitted her name to Obama in June, seven weeks before he recommended Vilardo, the White House has not yet nominated her. For lawyers who practice in one of the busiest federal court systems in the country, the delays in getting Vilardo and O’Donnell in black robes and on the bench are frustrating. “The judicial confirmation process has become an extremely drawn out thing,” said Timothy W. Hoover, a Buffalo attorney and board member of the New York State Association of Criminal Defense Lawyers. Schumer would not comment on Vilardo or O’Donnell, but several lawyers close to the process offered different takes on what may be holding up O’Donnell’s nomination by the White House. Several lawyers who spoke on the condition they not be identified said they believe her age may be an obstacle. She is 67, older than most judicial nominees. Others think the hurdle may be O’Donnell’s old political fund. Left over from her aborted campaign for state attorney general in 2006, the fund currently has a balance of $300,000. Still others wonder if partisan politics is the root cause of O’Donnell’s problems. They point to the Senate fight over Loretta Lynch, Obama’s nominee for U.S. attorney general, and the possibility of collateral damage to other judicial candidates. O’Donnell declined to comment but a source close to the process downplayed the delays – he attributed them to her extensive public record – and predicted the White House would move soon to nominate her. When Schumer picked O’Donnell, she became the first woman to be recommended for a district judgeship in Buffalo, the latest in a series of historic firsts for her. Eighteen years earlier, she was the first woman to serve as U.S. attorney in Buffalo. For a lot of people, even those who consider her a wise choice, O’Donnell’s selection was a surprise. Many of them thought her age would prove an insurmountable obstacle for Schumer and Obama. Her supporters are quick to note that she came into the process with one big advantage – she already had been screened by the Senate on two previous occasions. The latest review was for her current job as director of the U.S. Department of Justice’s Bureau of Justice. The bureau does research into criminal justice issues and oversees more than $5 billion in grants. Before joining the Obama administration, O’Donnell was New York State’s deputy secretary for public safety. She also served at one point as commissioner of the New York State Division of Criminal Justice Services. Geraci, who took over as chief judge when Skretny went to senior status, said he’s not privy to the background checks and vetting process, but he’s hopeful Vilardo and O’Donnell will be confirmed this year. One of the biggest reasons why is the federal caseload, one of the busiest in the nation, that awaits them. The courts here received more new filings last year – 744 new cases per judge – than all but nine of the 94 court systems across the country. One of the consequences of that is a backlog of civil and criminal cases that ranks among the worst in the nation. The reality is that the backlog – 14 percent of the civil cases here are more than 3 years old – would be even worse except for the productive nature of the judges in Buffalo and Rochester. The court system here ranked seventh out of 94 in closing cases last year, and a recent ranking of U.S. District Courts listed the local courts as the fourth-most-productive system in the country. The ranking of district courts was based, in large part, on the amount of time judges spent in the courtroom. In Buffalo and Rochester, judges spent more hours on the bench and more hours overseeing trials than all but three other court systems in the country last year. Hoover, who often appears in federal court, thinks the community is lucky to have a tradition of senior judges willing to stick around and pick up the slack. To hear Hoover talk, the four judges currently allocated for Buffalo and Rochester – two in each city – doesn’t come close to meeting the demands of the caseload here. He thinks the region needs another three district judges.